This picturesque garden was more than 50 years in the making. Originally a private space, its meticulously manicured grounds are now open for the public to enjoy. Whether you're up or down, the Elevator Museum is worth a stop. 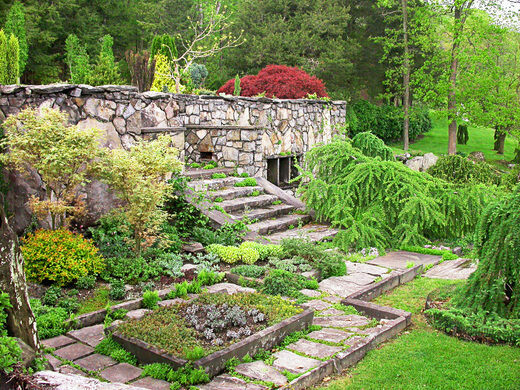 Walker and Marion Beck had the garden built between 1930 and 1960 as their own private oasis. They were inspired by eighth-century Chinese poet Wang Wei’s garden. Lester Collins was the landscape architect. Collins’ design is a wonderful Chinese-inspired garden, with Modernist and Romantic elements added to the mix. All parts of the garden seem to blend together seamlessly, resulting in a dreamy, meditative landscape. Most of the plants and rocks are native to the environment, adding a distinctly New York touch to the space. One long main trail winds through the grounds, with smaller trails splintering off to reveal other pockets of the park. Go for a walk, and you’ll come across peaceful views across a small lake and tiny waterfalls burbling with life. You’ll cross quaint stone bridges and spot a variety of art and wildlife nestled within the greenery. It feels as though you’ll find a new space to explore with every turn you take. The entry is much farther than expected, but is well marked. The garden is open seasonally (typically May though October). See its website for details. Admission is either $8 on weekends and $6 on weekdays. It'll take at least 90 minutes to explore the garden. Be aware that the paths are not paved. The second largest maple syrup producer in the U.S. runs a high-tech operation. This natural rock "church" might not be a proper chapel but that doesn't mean it's not beautiful. This amazing oasis of art and plants is hidden on the outskirts of Marrakesh.